Psalm 65 is said to have been written by King David around 1000 BCE, although the first record thereof, in Ancient Hebrew, dates from some four centuries later. This intriguing language contains such compressed and inventive constructs that I could not miss the opportunity to use it. I owe a great debt to Cantor Joseph Toltz of Temple Emanuel in Sydney, Australia, whose generous tuition made this possible. The final five lines of the psalm are sung twice, first in Hebrew and then in English. 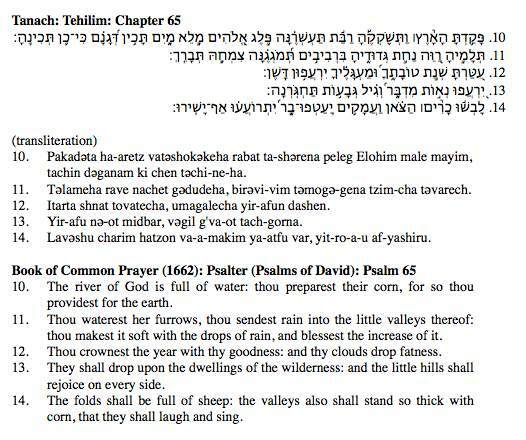 Although the original Hebrew includes a system of symbols indicating rhythm and pitch (the “ta’amei emet”) there is uncertainty about the exact interpretation of these for the psalms, and I have opted for a more general version of spoken Hebrew. I chose the English translation from the Book of Common Prayer (1662) since it seems closer than most to the Hebrew while adding some sensitive imagery of its own. This psalm expresses gratitude for the bounty of the earth, its ample water, rich harvests and plentiful flocks. The Hebrew portion is a simple paean of appreciation in which the valleys themselves are so grateful for their luxuriance that “they shall laugh and sing”. The intensity and directness of this thanksgiving speaks of an intimate connection with the true fundaments of life that seems alien today. We have taken the earth’s natural riches for granted for a very long time, but must now seriously contemplate losing many of them, if not all, within the span of a life or two. With the repeated revelation of ever new ways in which we have failed to cherish the foundation of sustainable life comes a sense of loss that is almost unbearable. What did the final inhabitant of Easter Island feel as they watched the last tree being felled? This sensibility is reflected in the second half of the psalm setting. Despite the considerable bang of our industrialised, mechanised, digitalised world, we shall be undone ultimately by a failure to adequately treasure the simplest of resources. I fear it shall end, sooner rather than later, with a whimper. They Shall Laugh and Sing was commissioned by Hale School in Perth, Western Australia, in honour of its 150th anniversary in 2008. It was first performed by the Hale Saint Mary's Cantate on Saturday 9th August 2008 in the Perth Concert Hall, conducted by Andrew Bushell, the school's Head of Music.